The New York Times remains among the most trusted news sources. A winner of 106 Pulitzer Prizes, the paper now performs as one of the leading online news sources. 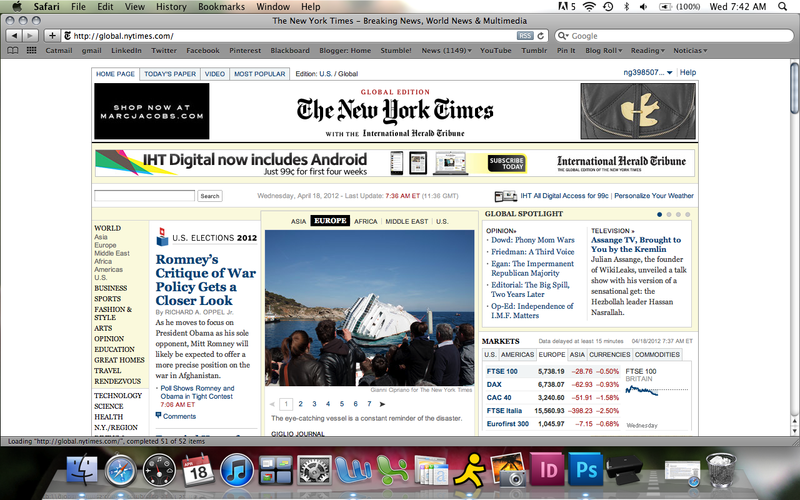 Readers encounter a wealth of information upon visiting nytimes.com. The website automatically directs viewers to its global page, however readers have their choice of material from there. At the top of the page, they may choose among the “home page,” “today’s paper,” “video” and “most popular” sections. Along the left, they can choose to read by global region (such as Asia, Europe, or the Middle East ) or by topic (such as business, sports, or arts). The home page not only presents readers tabs to direct their experience, but also provides photos, links, headlines and ways to interact. Although non-subscribers may only view 10 articles per month, The New York Times’ news and information is accessible through numerous Twitter handles—corresponding to newspaper sections—through numerous Facebook pages and through smart phone applications. The website similarly formats all articles. A headline and photo sit near the top, similar to a printed article. Next to the first several paragraphs, readers encounter a toolbar, allowing them to share the story through social media or even print a hard copy. To the left of the article, The New York Times offers links to related articles, additional art and available multimedia. Such a layout allows for and encourages reader interaction. The New Your Times Company owns The New York Times in addition to the International Herald Tribune, The Boston Globe, NYTimes.com, BostonGlobe.com, Boston.com and About.com, In 2011, the company earned $2.3 billion dollars in revenues.